The Grenfell Mission provided some of the earliest permanent medical services in Labrador and northern Newfoundland. 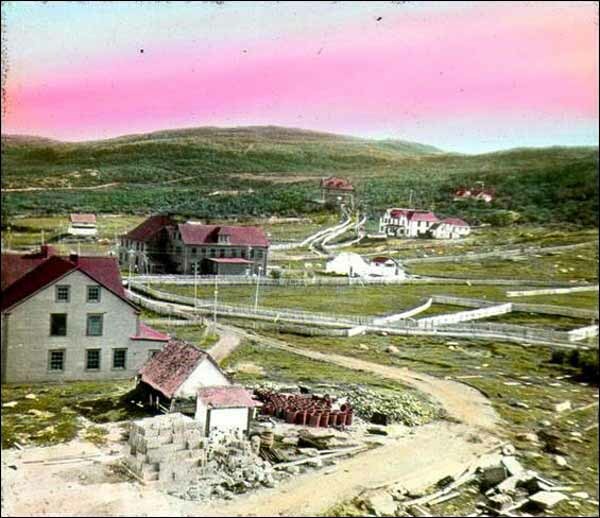 Before the mission opened its first hospital at Battle Harbour in 1893, almost no health-care resources existed in the area – hospitals were nonexistent, no formally trained nurses were on hand, and although some physicians occasionally visited the Labrador coast from the island of Newfoundland or the United Kingdom, no resident doctor practiced there. At first chiefly a summer operation, the mission steadily expanded over the years and began offering year-round services by the turn of the century. British medical missionary Wilfred Grenfell devoted much of his life to the establishment of regular health-care services in Labrador and northern Newfoundland. From Wilfred T. Grenfell, Down to the Sea (New York: Fleming H. Revell Company, 1910) 184. Alongside its medical endeavours, the mission sought to make other social changes, specifically in the areas of education, agriculture, and industrial development. To this end, mission workers built schools and helped establish lumber mills, community farms, co-operative stores, and a commercial handicraft industry to create alternative sources of income. 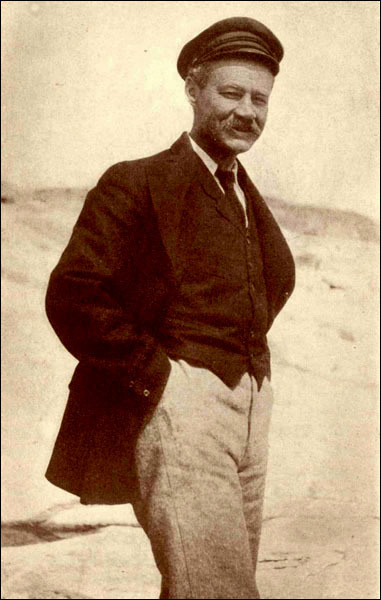 British medical missionary Wilfred Grenfell arrived at Labrador in 1892 to investigate living conditions among local fishers for the United Kingdom's National Mission to Deep Sea Fishermen. He spent much of the summer sailing up and down the Labrador coast aboard the medical vessel Albert, treating about 900 people for a wide range of illnesses. Shocked by the area's widespread poverty and almost complete absence of medical resources, Grenfell spent the next year raising money at St. John's and England to establish regular health-care services in Labrador. He did much of this independent of the Mission to Deep Sea Fishermen, which felt Grenfell's vision was beyond its scope and finances. As a result, the Grenfell Mission (later the International Grenfell Association) eventually formed and provided medical services in Labrador for close to a century. Grenfell returned to Labrador the following summer with two physicians, Eliot Curwen and Alfred Bobardt, and two nurses, Sisters Cecilia Williams and Ada Carwardine. The mission opened a hospital at Battle Harbour and began construction on another at Indian Harbour. It also acquired a second hospital boat, the Princess May, to help medical personnel service fishing stations and coastal communities. Grenfell opened his first Labrador hospital at Battle Harbour in 1893. Photographer unknown. Reproduced by the permission of the Maritime History Archive (PF-325.098), Memorial University, St. John's, NL. Before leaving Labrador later that fall, Grenfell visited 87 ports aboard the Princess May and treated 794 patients. Curwen received another 1,052 aboard the Albert, while Bobardt attended to 33 in-patients and 647 out-patients at the Battle Harbour hospital. Most of these were members of the migratory fishing fleet, which sailed from Newfoundland to Labrador each summer. Upon his return to St. John's that November, Grenfell continued to raise money and support for his mission by delivering lectures and showing lantern slides of Labrador. He and Bobardt also completed a lecture tour of Canada, where they received sizeable donations from various religious organizations, political officials, and private citizens. At Montreal, the men received the medical yacht Dahinda from Sir Donald Smith, president of the Canadian Pacific Railway and the Bank of Montreal, as well as a smaller vessel, the Eurilia McKinnon, from Thomas Roddick, a Newfoundland physician practicing in Quebec. 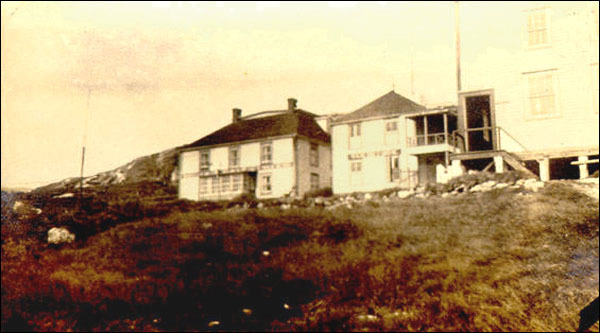 The mission opened a summer hospital at Indian Harbour in 1894 and continued operating its Battle Harbour facility throughout the following winter under the supervision of Dr. Frederick Willway. Alongside receiving patients at the hospital, Willway traveled about 1,800 miles up and down the Labrador coast by dog sled, treating the ill and injured. The mission steadily grew as the years passed. It acquired the large medical vessel Strathcona in 1899, named for mission donor and first Baron Strathcona, Sir Donald Smith. The ship was one of the world's first to carry x-ray equipment, and also contained a dispensary, emergency cots, and space for a mission hall. 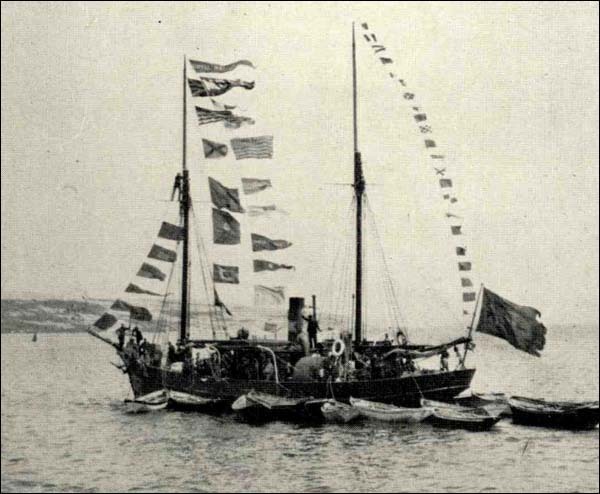 The Grenfell Mission acquired the medical vessel Strathcona in 1899, which allowed volunteers to treat patients at remote fishing stations and coastal communities in Labrador and northern Newfoundland. From Wilfred T. Grenfell,Labrador: The Country and the People(New York: The MacMillan Company, 1910) 246. By 1901 the mission established a presence on Newfoundland's Northern Peninsula, where it opened a year-round hospital at St. Anthony. The community became mission headquarters and Grenfell opened an orphanage and undenominational school there in 1904 and 1909, respectively. A string of hospitals also opened at various other Labrador communities, including North West River (1915), Saint Mary's River (1929), and Cartwright (1936), while nursing stations operated at Forteau (1908), Spotted Islands (1913), Lewis Bay (1920), Flower's Cove (1923), Mutton Bay (1926), and Englee (1936). The Grenfell Mission established a presence on Newfoundland's Northern Peninsula when it opened a year-round hospital at St. Anthony in 1901. Photographer unknown. Reproduced by the permission of the Maritime History Archive (PF-323.011), Memorial University of Newfoundland, St. John's, NL. Grenfell recruited numerous volunteers to work in the mission's hospitals and nursing stations. Some were wealthy or prominent members of society, including future New York governor Nelson Rockefeller and children of rubber manufacturer B.F. Goodrich, while others were highly qualified medical personnel from the United Kingdom and the United States. Most worked for a summer in Labrador or St. Anthony before returning to their regular work, while others, including physicians Harry Paddon and Cluny Macpherson, remained for years. Alongside providing medical services, the Grenfell Mission sought to improve living conditions in general for people in Labrador and northern Newfoundland. Mission workers hoped that by promoting education, agriculture, and industrial development they could make residents more self-reliant and create alternative sources of income. They opened schools at St. Anthony and various southeast Labrador communities, including Cartwright, North West River, and Muddy Bay. The mission also helped send promising students to well-respected colleges in the United States, provided adult education in carpentry and weaving, and operated orphanages at St. Anthony and Cartwright. To stimulate industrial development, the mission established a series of co-operative stores near many of its medical stations, which Grenfell hoped would “help the settlers to escape the 'truck system' of trade, and the consequent loss of independence and thrift” (Grenfell 1909, 240). Mission workers also helped create a local handicraft industry that allowed residents to sell hooked mats, knitted goods and other items at North American retail shops. Today, early Grenfell rugs are considered works of art; some are displayed in museums or galleries, while others are preserved in private art or antique collections. The Grenfell Mission helped created a local handicraft industry that allowed residents to sell their items at North American retail shops. Mat maker unknown. Reproduced by permission of Paula Laverty. 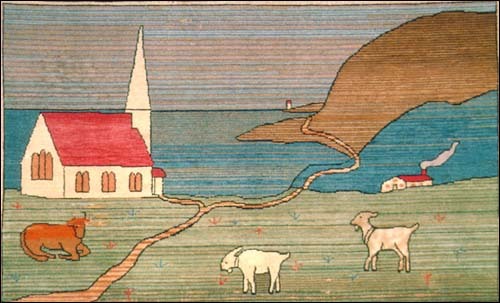 The mission also maintained large community farms at St. Anthony, Flower's Cove, and elsewhere, and at certain stations raised pigs, goats and other livestock. Workers encouraged families to cultivate private vegetable gardens as well, which they hoped would not only supplement local incomes, but also decrease malnutrition rates. However, the migratory lifestyle of most Labrador residents, combined with the region's inhospitable climate, made it impractical for them to grow crops; as a result, many gardens ended in failure. While doing much to improve the quality of life for many people in Labrador and northern Newfoundland, Grenfell's work sometimes conflicted with local ways of life. Instead of accommodating the migratory lifestyles of Labrador residents, the mission's hospitals, schools, and farms catered to a static and centralized population. Many volunteers came from the United Kingdom or North America, and although well-intentioned, often imposed their own values and traditions on the local population. Nonetheless, most Labrador residents welcomed mission workers into their communities. As the mission continued to grow, Grenfell recognized a need to better regulate its funding and organization. He incorporated it as a company under the Canadian Companies Act of 1899, forming the International Grenfell Association (IGA) in 1914. The IGA continued to provide medical care for Labrador and northern Newfoundland well into the 20th century, but received additional funding from the provincial government after Confederation. By the late 1970s, the province was paying for all the IGA's medical expenses and in 1981 the organization handed all of its nursing stations, hospitals, equipment, and other medical resources over to the provincial government for a fee of one dollar. Today, the Labrador-Grenfell Regional Health Authority delivers medical services to the area formerly under IGA care. The association still remains active as a private foundation and regularly awards grants to non-profit organizations for improving the health, education, and social welfare of people in coastal Labrador and northern Newfoundland. For other related articles view the Heath section of the Society and Culture Table of Contents.